Written by Jim Beary, Future Farmers of Yorkshire member kindly sponsored by the Yorkshire Agricultural Society to attend the Oxford Farming Conference 2019. I am an upland livestock farmer from Bradfield, South Yorkshire, in the Peak District National Park. 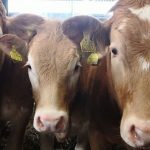 It is a 400-acre farm consisting of 800 ewes, producing prime lambs for Tesco, 130 contract dairy heifers, a small herd of Angus suckler cows, environmental stewardship and a contract winter gritting business. I was lucky enough to start 2019 on the Emerging Leaders course at the Oxford Farming Conference, this was a fantastic experience and an opportunity to meet and talk to a wide range of well informed and passionate people involved in agriculture. It opened my eyes up to just how big a deal food production is on the world stage and how important it is that we get things right. The main focus was as expected – the political situation facing farming here in the UK. This was a hot topic and sparked a lively debate, the most contentious issue being the threat of sub-standard imports being allowed into the UK at discounted prices. Sitting next to the Shadow Minister for Trade at dinner was a highlight for me, together with some other young farmers and the Ulster Farmers Union, we had a lengthy conversation with him and as a result he rewrote his speech for the following morning, quoting us as the reason for it being changed. The environment was also a key topic, with several speakers demonstrating changes they had made to their businesses which had resulted in significant environmental gains, a reduction in inputs and, more often than not, an increase in profitability. This was music to the various ministers’ ears, as they strongly hinted that this will likely be the direction of travel for future agricultural policy. There were also several speakers talking about the future role of technology and innovation in farming, this was just fascinating. The speed and level of progress is just incredible, with one company currently building a floating dairy farm and another using hydroponics to produce vegetable crops with remarkable efficiency. I don’t doubt that we will see more and more of this kind of thing happening and more farmers adopting technology and innovation to help their businesses. I would encourage anyone with a passion for food and farming, to attend the Oxford Farming Conference. 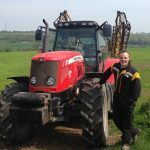 As well as the Emerging Leaders programme, there are scholarships available through the Yorkshire Agricultural Society. Earlier this month, the Future Farmers of Yorkshire hosted a discussion about the myths and facts surrounding meat and milk production. This is a very topical issue at the moment and is unlikely to go away any time soon, and why should it? As farmers, we need to become better at justifying what we do and more importantly ‘why’ we do it. We are entering an era where the process is becoming equally, if not more important than the product itself and it is essential that we secure social licence/public approval for what we do. In order to secure this we need to better sell the health benefits of meat and milk as well as the wider benefits to the environment and the public. Its every consumer’s right to ask questions and it should be every farmer’s responsibility to be able to answer the ‘why’. Perhaps we need to change the way we think if we want to progress.